There were any number of bands to come out of the nineties who seemed poised to become the next Who or Rolling Stones or Led Zeppelin or (insert enduring classic rock band of your choice here). Oasis certainly were one such contender. The British pop/rock band had the looks, the songwriting chops, and the bad boy image. But the tenuous relationship between brothers Noel and Liam Gallagher, the group's lead guitarist and lead vocalist, respectively, eventually tore the group apart. Not before they released 7 albums and influenced numerous other bands, though. The most interesting thing about the Gallagher brothers (the rest of their bandmates don't factor into the film all that much) is the fact they fight with each other. Frequently and intensely. We get to see a fair bit of that in the film. But they were also quite happy to dole out abuse, at least of the verbal variety, to other musicians they saw as lesser. Also helping to ensure that OASOS: SUPERSONIC stays a fun ride are the numerous anecdotes of typical rock n roll shenanigans, often involving intoxicants of one kind or another. All the footage we see is vintage, but much of the commentary comes from more recent interviews conducted for this documentary. It also bears mentioning that this was not a band whose main creative forces had any self esteem issues. Even before Oasis made it, we hear Noel Gallagher talking about killing off "McDonald's music", which to him constitutes artists like Sting and Phil Collins. He goes on to elaborate that, "I want the severed head of Phil Collins in my fridge by the end of this decade. And if I haven't, I'll be a failure." A bit harsh, perhaps, but then again, Mr. Collins did unleash "Susudio" on the world, so some might consider it a just punishment. 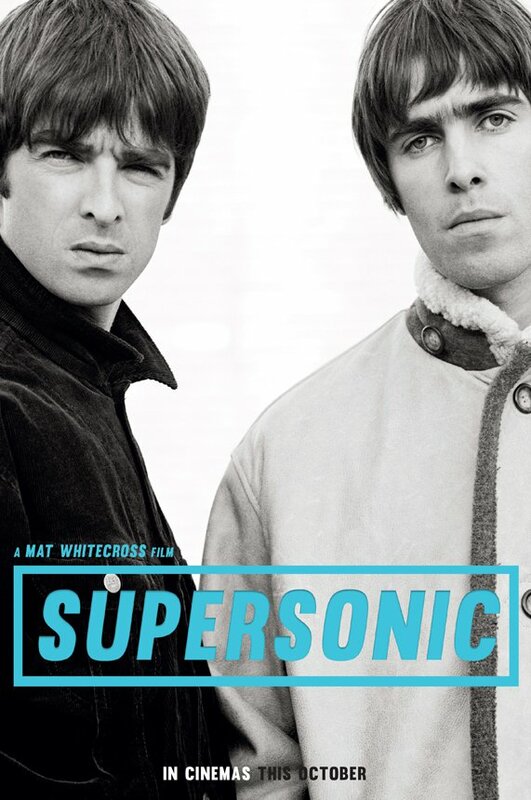 Directed by Mat Whitecross, OASIS: SUPERSONIC is an extensive (a little over 2 hours) record of the band's early years, from their inception through to the peak of their popularity, a 1996 concert at Knebworth. Since the group came up at a time when home video cameras were becoming common, there's a no shortage of footage from this era, even including pre-record deal practice sessions. I'm not sure most bands would want their early rehearsals seen or heard by anyone, but it's a testament to how tight these guys were that even this early on they sound like almost like their fully formed selves. This was not a group that needed a whole lot of molding by a producer. I have to be honest and say I was never a big fan of Oasis, and this movie didn't really change that for me. I don't dislike them, but they just aren't my cup of tea. So for me, SUPERSONIC is probably a bit more filled to bursting than I would like. For diehard fans, however, it offers an embarrassment of riches. Even if, as other reviews written by those more knowledgable about all things Oasis have pointed out, some fairly major stuff from this period is left out. And of course it's a little odd that the film doesn't encompass the band's entire career; just their early days. Guess that leaves room for a sequel. 3 out of 4 stars.